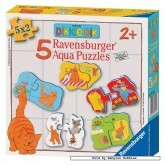 Aqua Puzzles There is 1 product. 5 puzzles of each 2 pieces in this box. Ideal to play in the bath tub. Once they are wet the puzzle pieces will stick to tiles or the side of the bath.